After much anticipation across the nation,President Obama signed the 2013 National Defense Authorization Act(NDAA) into law. In the end, it included 19 amendments to significantly reform Department of Defense sexual assault and sexual harassment policies. This landmark bill has thelargest number of sexual violence provisions ever signed into law, and represents the culmination of more than 18 months worth of relentless advocacy work by theService Women’s Action Network (SWAN). We want to thank the many veterans and service members who shared their voices to demand policy change this year, including Ayana Harrell, Nicole McCoy, Cindy McNally, Ruth Moore, Laura Sellinger and so many others. The NDAA is an enormous bill that specifies the budget and expenditures of theDepartment of Defense(DOD). It also contains sections that deal with military issues ranging from the total number of troops to retiree benefits, and everything in between. It is one of the primary vehicles used by Congress to provide oversight and mandate change within the military. Every year, SWAN partners with key members of Congress to provide bipartisan legislative recommendations to both the House and Senate to improve the welfare of service women and women veterans. Legislating reform of DOD policies can be a difficult, complicated and sometimes painfully slow process, and is only one of several tools SWAN uses to make institutional change happen. Ensuring those policies are properly implemented by the services and fairly practiced in individual units “where the rubber meets the road” is a continuous process for us. Calls from active duty troops and veterans on ourHelplinecontinue to inform and guide our work. We are grateful to be able to provide help to service members and veterans in need. We are also thankful for our incredible coalition of military, veterans and civil rights organizations, the members of Congress who have partnered with us, and each one of you who have supported us this year. In order to eradicate sexual assault and sexual harassment we must continue to work together to transform military culture. The passage of the 2013 NDAA is another critical step in moving the military one step closer to change. 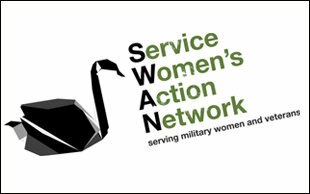 As we move forward with this year’s policy and legislative agenda, and prepare for our second annualSummit on Military Sexual Violence, SWAN will continue to hold our civilian and military leadership accountable for the welfare of our nation’s service members and veterans. We will continue to fight for changes in the execution of military justice for victims of sexual assault, service members’ access to civil courts, and comprehensive reform of VA policy regarding “Military Sexual Trauma” compensation claims. With your support, we look forward to continued success as we begin work on the 2014 NDAA.